What many people don’t know is Don Gibson scored hits with those iconic hits himself, all before superstars from all over the world took the tunes on themselves. “Sweet Dreams” was his first hit in 1958 and in this version of the album, Mandy changes it up in a unique way by making it more ‘tempo-driven’ and giving it a new spin — all the while not losing the song’s integrity and familiarity, a delicate balance met. “Too Soon To Know” is a deep cut from Don’s first album, Oh Lonesome Me while “Blue, Blue Day,” “I Can’t Stop Loving You” and, of course, “Oh, Lonesome Me” are on the very same record and all are reverently performed by Barnett here. There’s just something soothing about these songs, including non hit singles like “Legend In My Time” and “Oh Such A Stranger.” There’s just something fantastic about listing to a record like I Can’t Stop Loving You. It’s timeless, classic and soothing all at the same time. 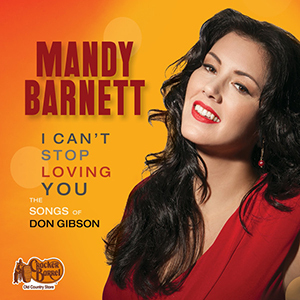 It may never win awards or sell multi-platinum but it definitely deserves any and all attention it brings Mandy Barnett and Don Gibson’s fantastic songs themselves.